Do you know the connection between your kids, stress and obesity? When you are stressed you tend to eat more of junk food as it has more sugar, salt and fat and the tongue craves for it. The body also demands more of sugar and glucose as it is becoming internally hyperactive. The obvious negative impact is increasing levels of blood sugar and fat. Therefore, obesity, diabetes and blood pressure are directly linked to stress. However, do you know the connection between your stress and obesity in your children? 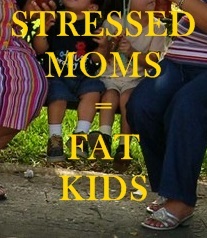 When you are stressed, your children become fat. It has been found that parents who are stressed, do not eat healthy. Their mind is not into serving the correct kind of food to their children. Since they are so occupied mentally, they may not have the time, inclination or ability to prepare and serve healthy food. Therefore, they tend to serve junk foods and packaged foods to their kids more often than parents who are not stressed. A recent study published in the journal of pediatrics found that stressed parents of children between the age group of 3 and 17 would order more junk food from outside or serve junk food at home. The result is unhealthy or overweight children. This is in contrast to parents who were not stressed and relatively relaxed. They served the right kind of food to their children. – Just simply giving your children to eat what you eat when you are stressed.